Similar to the Turkish Red, but with a slightly different flavor. A blend of of turkish tobaccos and Virginia tobacco that delivers a slightly more medium-bodied taste. OHM pipe tobacco is a medium cut, strong pipe tobacco that limits shake and stems using an intricate filtering procedure prior to packaging. This method ensures that every bag, no matter the size is perfectly mixed and flavored to deliver an unmatched experience. Manufactured by Inter-Continental Trading USA Inc., this flagship tobacco is made from the finest American-grown tobaccos. Every bag is packaged and sealed in a Fresh-Loc re-sealable bag to guarantee freshness and quality. Do you offer any discounts or coupons? Yes! The most commonly used discount that we offer is free economy shipping for all orders over $120. It is automatically applied at checkout, no extra steps required. Along with our everyday shipping discount we offer occasional discounts and coupons on this and many other products in our store, exclusively to our email subscribers. Not sure if you're a subscriber? Make sure you join our mailing list during checkout! We will never spam you. Promise. Is my Tobacco too dry? Simple answer: Maybe, but it's an easy fix! During the tobacco packing and manufacturing process, raw tobacco gets sent through re-dryers to remove all moisture. Later on in the process, moisture is added per product and brand specifications. This is true for most, if not all Pipe Tobacco's on the market today. What does all that mean? Well, in most cases tobacco is packed based on net weight. It is to your advantage to buy dryer tobacco, because you are getting more for your money. If, however the tobacco is too dry for your tastes there are a number of solutions to this common problem. Best method is to use a mist/spray bottle filled with water and lightly spray the tobacco inside the pouch. Zip the pouch back up and leave it to sit for an hour or two. This should be enough time to notice a significant difference in the tobacco. Just be careful not to over do it. It is much easier to add moisture to tobacco than to remove it. Just repeat the process until the tobacco is to you liking. We hope that you never have to worry about this issue, but in case you do, we have you covered. Simply let us know what the problem is. We will work with you on a solution to ensure that you leave happy and satisfied. In most cases if the products are unopened and unused we will give you a full refund. OHM Turkish Yellow makes the best Turkish blend for RYO! Before trying it I was buying whole leaf and having to shred it by hand. If you are a fan of those name brand Turkish smokes you won't be disappointed here. You might find a few more stems per bag, but this is still a bargain. Moisture content is fine for stuffing and is easily maintained after opening the bag. I prefer this over the store bought smokes. This OHM Turkish Yellow is one of my favorites. Rolls easy and tastes good. Good price for the quality. Tried to order more but ...out-of-stock. Will purchase again. Recommended. Love the deals at Tobacco General. I would have never heard about OHM Tobacco if I hadn't bought it from them. I'm working my way through all the OHM Tobacco varieties and OHM has become my favorite brand. A medium moisture tobacco, it was a breeze to roll in my Powermatic. Some fine shreads but easily intergrated into the cigarettes. Upon opening the bag, had a great fresh aroma, with alittle smoky "sweetness". Good mild taste and no after-taste. I'm giving OHM Turkish Yellow 4 stars only because I prefer the OHM Natural taste, but if you like a mildly sweet tobacco this is a good one. 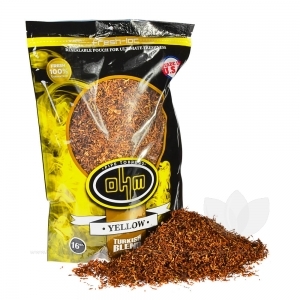 OHM Turkish Yellow was the very first tobacco I purchased when I started rolling my own. I made the right decision! OHM makes one great smoke. I found it very smooth tasting, not harsh. The bag contained just the right amount of moistness to make rolling your own a breeze. Try this, you wont regret it!